Would you rather dance beneath the waves or hide your smuggled magic there? 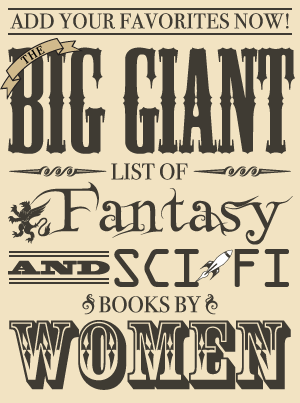 Welcome to a world of sparkling adult fantasy and science fiction stories edited by Stephanie Burgis and Tiffany Trent and featuring underwater ballrooms of one sort or another, from a 1920s ballroom to a Martian hotel to a grand rock ‘n roll ball held in the heart of Faery itself. 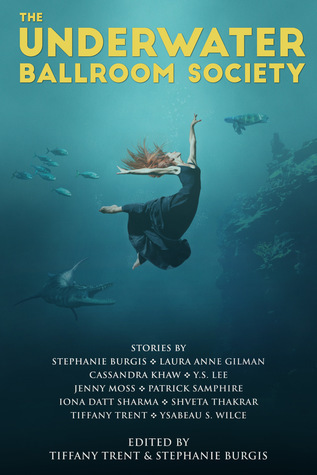 The Underwater Ballroom Society is an anthology of ten speculative fiction tales with a variety of subgenres, prose styles, and themes that share one element in common: each of them includes some sort of underwater ballroom, although its overall importance to the plot varies from story to story. Of course, how engaging I found each story also varied. Most of them were about average for me, but there were two I thought were exceptional and two others I thought were standouts with only one that I didn’t like. My favorite is one of two novellas in this anthology, “Spellswept” by Stephanie Burgis. It’s a prequel to The Harwood Spellbook novellas (Snowspelled and Thornbound), set in an alternate nineteenth century England in which tradition dictates that only women can be politicians and only men can be magicians (and only a woman married to a magician can be part of the group of women that rule the nation). However, the protagonist is not Cassandra Harwood, the first woman to become a magician, but her supportive, practical sister-in-law, Amy—though she isn’t yet officially part of the Harwood family in this prequel. “Spellswept” tells two stories that occur during a party in an underwater ballroom: that of Amy and Jonathan’s engagement and that of Cassandra’s first public spellcasting. Another highlight is “The Queen of Life” by Ysabeau S. Wilce, a whimsical story that starts with a rock band’s gorgeous guitarist being swept off to Faery by Oberon. Although the beginning is self indulgent and seems to take too long to get to the point, I was enchanted once it began following its true hero: the band’s singer, Sylvanna, now eighty-two-years old and determined to retrieve the man Oberon stole from her so long ago. After she tricks Death to enact her plan to do just that, her journey takes unexpected twists and turns, and she doesn’t end up making the choices she’d anticipated when she first set out on her quest. This story is largely about Sylvanna herself while being an ode to the personal growth that comes from age and experience. Two other stories I found notable are “Twelve Sisters” by Y.S. Lee and “Penhallow Amid Passing Things” by Iona Datt Sharma. The former is a sequel to the fairy tale “Twelve Dancing Princesses” that challenges the wisdom of choosing a king based on someone’s ability to successfully solve one mystery. The prince who discovered the secret of the twelve dancing princesses turned out to be a domestic abuser who will be a terrible ruler, and the youngest of the sisters hopes that all twelve of them working together can correct that mistake before their father dies and the crown passes to him. Of course there’s some tragedy given its content, but it also contains some wonder in its beautifully imagined underwater ballroom, and there’s a touch of charming humor too (the hedgewitch!). Though I did find it a bit slow and therefore not quite as compelling as the others I’ve discussed so far, “Penhallow Amid Passing Things” is perhaps the best written of all the stories. This story is about a smuggler and a King’s woman who are usually on opposite sides of the law but find themselves uniting for a common cause (and there is some romance between these two women as well!). There wasn’t as much emphasis on the underwater ballroom in this one, but I did rather like the idea of a secret room under the sea for hiding smuggled goods. Most of the other stories were okay: I didn’t dislike them, but I didn’t find them particularly memorable, either. Tiffany Trent’s “Mermaids, Singing,” about a charmed werewolf king who manages to escape the circus where he’s been enslaved, was readable but forgettable once finished. I felt similarly about “A Brand New Thing” by Jenny Moss, which focused on a woman who didn’t fit in with her family discovering an underwater dome in a lake, even though I thought its vivid ballroom was one of the best ones. The longest story, “A Spy in the Deep” by Patrick Samphire, follows a spy-in-training who is tested with an undercover mission for an intelligence agency on a Regency/steampunk Mars. Though fun, I felt that it could have been trimmed since it took some time to get going, and I also thought that the characters were sometimes a bit over the top. The only story I did not enjoy to some extent was “The River Always Wins” by Laura Anne Gilman, in which a siren and Erinyes visit an underwater club one last time before it closes and relive some memories—including one rather traumatic one. Although I liked that it centered female friendship and feminism, I didn’t find it developed enough to interest me and was bored by the club scene. The Underwater Ballroom Society contains a few gems, including one that is significantly longer than most of the other stories in the anthology. However, I did find about half the stories fairly forgettable, even though I could appreciate aspects of most of these tales. Where I got my reading copy: Electronic ARC from one of the editors.